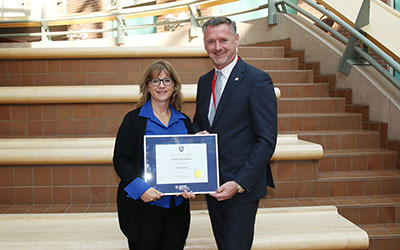 Justice Institute of British Columbia (JIBC) recognized service and teaching excellence at the 18th annual JIBC Awards of Excellence ceremony held at its New Westminster campus today. 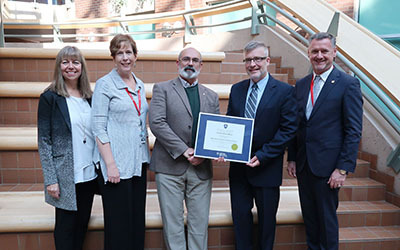 The awards were presented by JIBC President and CEO Dr. Michel Tarko as well as Colleen Vaughan, Vice-President Academic, and Kayoko Takeuchi, Vice-President, Finance and Operations at the event, which was webcast live to JIBC staff at its satellite campuses. Steve Schnitzer joined JIBC in September 2010 as a Program Coordinator for the Police Academy’s Law Enforcement & Regulatory Training. Today, he is the Director of the Police Academy. 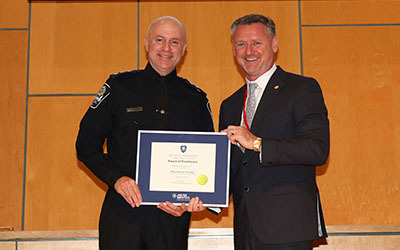 Steve was instrumental in overseeing the dramatic and ground-breaking change to the Police Recruit Training program which is this year’s recipient of the Program of Excellence Award. Historically, police academies and training institutions have utilized a lecture-based training approach with micro simulations. Under Steve’s unwavering leadership, the Police Academy developed and implemented a case-based curriculum based on competencies. In addition, Steve was instrumental in chairing a committee to create a conference on the opioid crisis for senior police leaders. In this role, Steve was required to pull together a diverse group of first responders from throughout Canada and the United States as well as other subject matter experts on opioids. Steve also initiated and directed the implementation of strategies to assist students including a mentorship program, directed studies program and an appeal process for recruits. Karen has held her current role since the inception of OARGS in 2010. She has been its key administrator and has provided foundational support for its continued growth and success. Considered an organizational mastermind, she is devoted to ensuring a seamless workflow at OARGS. Karen has spearheaded the organization of the OARGS Applied Research Day held each spring. She consistently goes above and beyond to support research teams and is able to communicate, collaborate, and provide the invisible support required to pull off complex meetings and workshops. She identifies and takes on critical tasks that might otherwise be missed while also organizing and streamlining processes and procedures on long-term projects. Jeff has been a sessional instructor with JIBC since 2011. 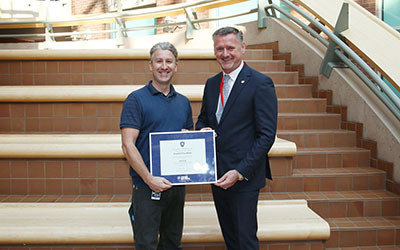 Several times each year, Jeff travels from Australia, where he lives for part of the year, to BC, to teach face-to-face in the Community Paramedicine program. As a Community Paramedicine Lead Instructor, Jeff teaches cohorts of BC Emergency Health Services staff members about the management of chronic health conditions, the role of the community paramedic, relationship building and advanced communications. During the online portion of this program, Jeff often stays up late and wakes up early to host teleconferences and to answer student questions. Jeff has done an incredible job of ensuring that program graduates are prepared to do their work by providing support and education to underserved populations in rural and remote locations. He has focused on providing students with the knowledge and tools necessary for them to do their jobs. In a sense, he has been “teaching them to fish,” so that they can be successful, no matter where their careers take them or how their jobs change in the future. The JIBC Disaster Resilience Planning Program is a stellar example of how JIBC contributes professional, applied research and training expertise to build safer, healthier and more resilient communities in BC, across Canada and abroad. The creation and continued development of this applied research program is highly relevant in the context of the vulnerability of small coastal, remote and rural communities to natural disasters and hazards. This was clearly evidenced with last year’s surge of BC wildfires and floods that put the province in a state of emergency for at least 10 weeks. Such communities face a number of socio-economic and geographical challenges. The resulting Rural Disaster Resilience Planning Framework is a flexible, participatory, and community-centered process for engaging remote and rural communities in disaster resilience planning at the local level with a focus on enhancing local capacity and capability. It is available online and has received international awards. It has also contributed to enhanced and new curriculum at JIBC, and increased research capacity, technical innovation and expertise, and professional development. JIBC’s Police Academy trains all new municipal, tribal, and transit police recruits in BC. Full implementation of the new delivery model of the recruit training program started in May 2017. The new delivery model was developed in response to the requirement to align the program with the Police Sector Council National Framework of Competencies. It is the first program in Canada to integrate this national standard. The change involved a complete redesign and rethinking of all three blocks of the police recruit training, as well as an overhaul of the associated Field Trainer Course. There was extensive consultation with the core client, Policing and Security Branch, and with instructors and other subject matter experts. The new model was designed based on educational theory, including case-based, and competency-based education, incorporating the best adult-learning principles. It is designed to build critical thinking skills, to better meet the changing expectations of police in modern society. Dian’s association with JIBC began as early as 2008 when she approached the Centre for Conflict Resolution to deliver training for the learners of the Essential Skills for Aboriginal Futures (ESAF) program, an Indigenous employment initiative sponsored by ACCESS. Since then, her relationship with JIBC has grown, most notably with the partnership which began in 2012 between BC Housing’s Leadership and Learning division and JIBC’s Centre for Leadership. JIBC won the RFP to develop and deliver the Competencies in Leadership Integrated Program (CLIP). 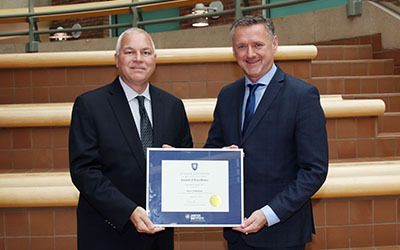 This two-year program partnership won gold in the Blended Learning category at the Canadian Awards for Training Excellence. Dian created the program vision and co-developed and contributed various modules. This program is now engaging its seventh cohort of mid-to-senior managers at BC Housing. Through JIBC’s relationship with Dian and BC Housing, the Institute has provided leadership training and education to over 300 BC Housing employees at all levels. JIBC has also been included to facilitate CLIP modules for the BC Non-Profit Housing Association and the Cross Crown Learning Council. The latter is comprised of senior leaders in several areas who engage in dialogue and shared learning between the numerous BC Crown Corporations. JIBC is the only post-secondary institute represented at the council. In addition to the Awards of Excellence, longstanding service was also celebrated. A total of 28 employees received service pins for 5, 10 and 15 years of service. Seven employees reached the 20-year mark, and two have completed 25 years of service. 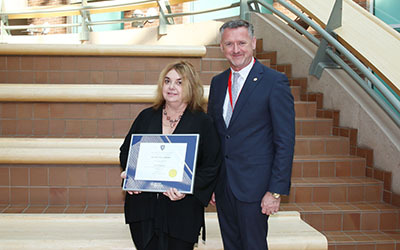 Paula Nemec from Corrections & Court Services Division was recognized for 30 years of service, and Sherri Rudeloff of the Fire & Safety Division was recognized for reaching her 35th anniversary with JIBC.